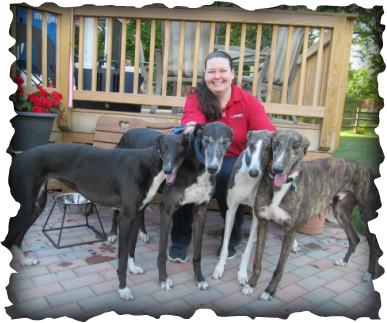 Unleashthespeed, nickname Speedy (but the family has not decided to keep that name yet) was adopted by Ron and Angie who live in Frankfort, KY. Angie has been on the GAGC board of directors for many years and has been the creator of our GREYT GAGC CALENDAR every year! When they heard of Unleashthespeed retiring, they wanted to foster him. They adopted his sister 5 months ago. Only two pups in that litter and Angie thought it would be nice if they could stay together! Lucky boy for sure! His adoption was final at the GAGC Fall Fun Day!